I’m going to try my very best to describe what it feels like to be in a Cordon Bleu kitchen. This is going to be totally from my perspective, so although all the below feelings would likely be shared amongst most students, please keep in mind not everyone is a nut case like me. I start getting ready to go to school two and a half hours before. It’s a little panicky for me every time as I triple-check what I need to bring that day, and try to recall my locker the way I left it. My worst nightmare is showing up at school without a piece of my uniform, be it the cap, the necktie, or the trousers. A student without a complete uniform is not allowed to enter into the classroom. I leave our apartment about an hour and a half before class. The Métro ride is about 45 to 50 minutes door-to-door, with one transfer in between. I get to school, change into my outfit, grab my hair into a twist at my neck, put on the cafeteria-lady-esque hairnet and my cap, tie the very large apron around my waist a couple of times, slot in the tea towel in the apron waistband, and begin packing my equipment bag for the kitchen. From the demonstration, we can see what the chefs use to prepare the pastries, so we are supposed to write this down and pack accordingly. The digital scale and measuring bowls are regulars, as are the super-strong magnets that hold down our parchment paper. Then there may be a knife or two, piping tips, and the trusty pastry scraper. I throw all of this together, and here’s the best part: we stand in front of the kitchen 20-30 minutes before class even begins. I’m not sure why people started doing this, but as peer pressure works its magic, I too am compelled to arrive at school super early, get changed, and just stand in hallways. We stand in the hallway and make small talk, observing the class assistants who set up the ingredients on the marble worktop. Sometimes we might hear the chef already in the kitchen and try to guess who it may be. Mostly, I feel fidgety and anxious. See, the teaching method at Le Cordon Bleu really values tradition above all else. Traditional recipes, traditional baking methods, and traditional “kitchen hierarchies” in order to learn. The chefs are very particular about the steps involved to make the products, and they are all non-too-hesitant to resort to impatient yelling if students are not doing what they deem is 100% correct. That’s where the kitchen hierarchy comes in. Chef rules all in the kitchen, and every comment should have a respectful and prompt reply of “Oui chef!” On the first day of school, the principal made a point to tell us that if our chefs call us putain in the kitchen, he doesn’t mean it – it’s just the way they yell at you so you learn. As a Canadian who was told off by my high school French teacher about the difference between poutine and putain, I was thoroughly appalled. When the chef is ready to begin class, usually about 5 minutes before the scheduled time, he will invite us into the kitchen. Then and only then are we allowed to enter into the kitchen, find a spot along the marble worktop, and set up our equipment. Our practical classes are scheduled to be about 3 hours, but usually there’s no definite end time, and classes last for about 2.5 hours instead. As mentioned above, the chefs are keen on steps – but they are also very time-conscious and will start reminding us of timing as soon as we begin weighing out our ingredients. “Allez allez allez!” is probably one of their favourites, along with an “expectation-management” prologue at the beginning for when they expect everything to be in the oven. For those reasons, my recipes that I bring into class are full of ridiculous details like, now weigh out flour and baking soda. Weigh water directly into pot. Put the bowl down and go grab a cooling rack. I basically try to simulate the most efficient way to accomplish all the tasks in the right order, and actually write them out in my notes to remind myself. For the record, I don’t tend to look at my recipe that often as I work, but the act of writing steps out in such ludicrous detail definitely helps me in class. Piping after WAY too much whisking. Look closely, you can see in the rosettes where my arm started wobbling from all that work. P.S. I realized afterwards the leaves don’t look right, but too late. My rose is “special”. 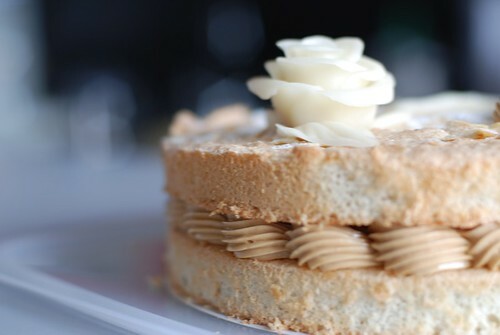 So today in class, we made dacquoise cakes. 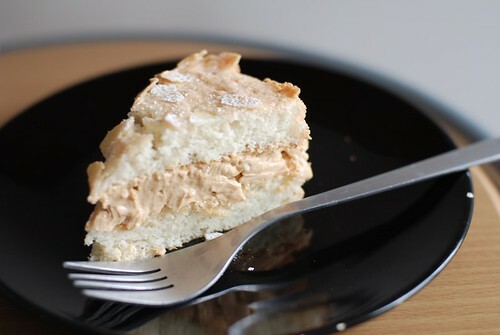 Dacquoise is a nutty meringue cake (with a little bit of flour) that is super light. I had never been a big fan before, and I didn’t quite like the one the chef made in demo either. I thought it was kind of dry and I’m not really a fan of dry crumbly cakes. However, the products that have come out of the practical classrooms under different chefs’ supervision have been much nicer – light and just the right balance between dry and moist. The chef arrived in a grumpy mood, and it was the chef who really liked me last time. I think he is not really a morning person, maybe, because he was impatient and critical today. He began the class with lots of stern warnings on what not to do, all rattled off in French loudly and grouchily. The Chinese contingent and the non-French-speakers in my corner all turned to me with nervous expressions for a translation – it was going to be a stressful morning. We began by whisking the egg whites into meringue, BY HAND. My friend unfortunately added her sugar a little too early, so she had to throw out her first batch and re-whisk. That took a good twenty minutes, or what felt like an eternity, before the meringues started forming. Then we were supposed to fold in the ground almonds…except, now that I think about it, the demo chef didn’t say much about this step. He just mixed the stuff in. Not a good demo chef exactly, eh? So there we were, folding in our dry ingredients…except quite a few people started beating the crap out of their meringue while mixing in the dry ingredients, and the chef lost it on them. I folded with trepidation, which worked against me, because then it took longer for me to get everything evenly distributed, and my meringue started deflating a little bit. When I handed it to the chef to put into the oven, he looked at my meringues with disdain and shook his head. See, I told you he was not in a good mood. Then we whisked egg yolks (7 of them), cooked sugar and water and tested doneness with our fingers in 116-degree (Celsius) boiling sugar, and whisked FOR ANOTHER ETERNITY to make the buttercream. I think that was a good solid 30 minutes of continuous whisking. I wish I were ambidextrous, because at this rate, my already-slightly-bigger right arm is going to get a lot more muscular very quickly. This is totally the “traditional method” thing again – everything is to be done by hand so we can feel. Machines will whip past the different stages too quickly for us to notice the process, or to realize we’ve done something a little too much. I think it’s really neat that we do this, but I am so looking forward to the days when I will make the recipes at home, with my beloved KitchenAid. Anyway, we had to whisk the boiling hot sugar until they reached room temperature, then slowly whisk in more than 300g of butter and praline, little bit at a time, to make the buttercream. I think my arm is in the buttercream, too – it’s definitely fallen off at some point. After all that whisking, we had to pipe the buttercream onto the cakes. 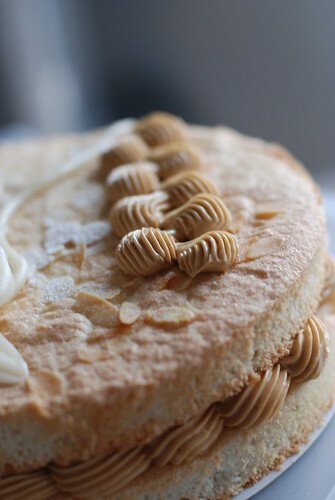 I love the delicate design, and the fact that the cakes don’t need to be smothered in buttercream here. The only problem is, my arms do that really embarrassing thing where they shake uncontrollably if I have exerted much more force than usual. So with very unsteady arms, I set out to pipe my rosettes. I think I can get them to look more uniform – on a day when my arm is still correctly attached to my body. 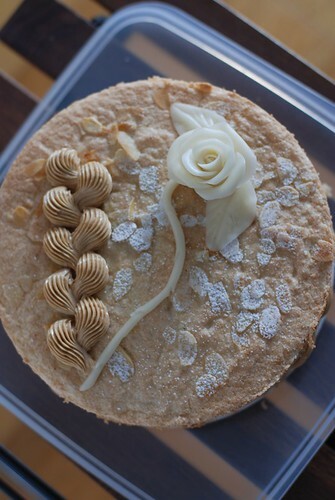 We also had to make a marzipan rose to sit on top of the cakes, which was kind of fun. 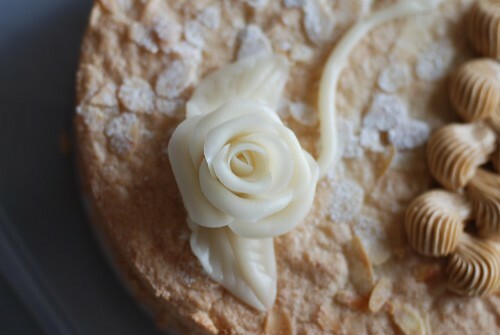 Normally I enjoy playing with fondant and stuff like this to make stuff, and the chef showed us some great techniques for making the petals look delicate. However, I was also in a bit of a rush as half of the class had finished by then and I didn’t want to be the last person there, getting the full wrath from the chef for being late. My rose – it’s a little bit like a cabbage, too. Oh well. 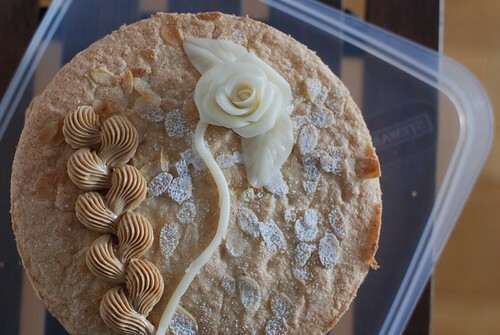 When the chef inspected my work, he pointed out that the rosettes were inconsistent – some nice bits, some not-so-great. I tried to explain that I didn’t quite know how to connect the beginning to the end, but he shushed me by telling me “c’est moi qui parle maintenant!” so I had no chance. He was happy with my rose though, and you can tell he is a nice man who doesn’t want to be hated for his outbursts in the kitchen, because he was making amends with everyone and doling out hugs and encouraging words to those he yelled at most. I brought mine home, and we’ve had about a quarter already today – yikes. We desperately need visitors soon to help us eat all this stuff!! Also, I can have a visitor per session to sit in on a class – so if you want to see what it feels like to be in a Cordon Bleu classroom, come to Paris! Oh, I would drop everything and go right now if airfare cost pennies! I am really enjoying reading about all of your Parisian culinary adventures, and am painfully jealous as I imagine it all. It really is the most wonderful place. And I am glad to see you are learning such fabulous things! Keep up the posts, I am now living vicariously through you while pretending academic jargon is a romance language. That looks absolutely delicious. Sandy – you are so brave (and talented)! @emvandee – maybe schlepping a baby across the atlantic would be even better? or perhaps an escape from breastfeeding? i’m here till at least end of march, so if anything changes, i’m here! @Bright Smile – thanks, can’t wait to hear about your trip to Paris and your favourite haunts! You saved my life that day!! What a serendipitous moment..AND you have a really lovely blog.